Eliminates odours. Extracts of basil, patchouli & geranium. Made with natural wax and allergen-free fragrances. 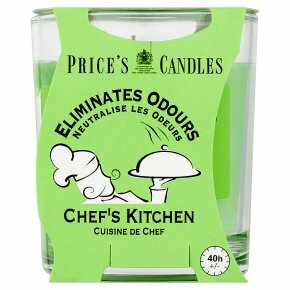 Contains odourfoyl to neutralise unwanted cooking odours. Warning: Never leave burning candles unattended.<br>Remove all packaging before use. Trim wick to approx. 8 mm prior to use and re-use. Place in an upright position on a heat resistant surface. Keep out of reach of children and pets and away from draughts and flammable materials. Do not put debris on wax surface. Do not move when lit or when wax is still liquid. If candle overheats and flares, cover with a damp cloth, never use water! Leave at least 10 cm of space between lit candles.